Since we have arrived here in Bogotá, we have experience many new things. Some things are cool and interesting and others are odd and different. Fruits: there are so many new and delicious fruits here that are not available in the US. Jugo (pronounced “hugo”) = juice: jugo is served with almost every meal. And not just any juice from a carton or bottle but fresh squeezed deliciousness. Climate: the weather here is amazing. Pretty much like a cool fall day every day of the year. The sun rises and sets and pretty much the same time every day. Mountains: they are beautiful and I love looking at them everyday. And they are the baseline for all the grid street numbers. Delivery: Everywhere delivers! Grocery store, pharmacy, butcher, you name it . . . ask and you shall receive. 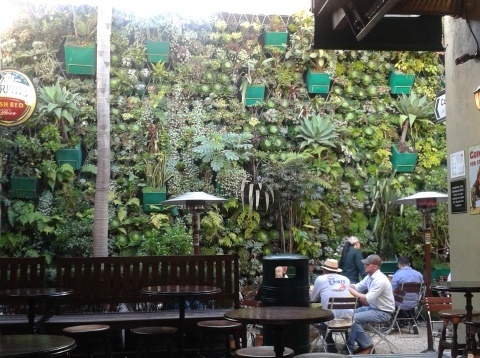 Wall of green: many places have “living” walls which are typically greenery plants that grow on the out of an installed wall potting system. They are pretty cool and add a great atmosphere to any area. Stares: Yes, we are gringos and clearly not from here. Especially Ross. It is funny to watch people react to us. One day, a guy almost broke his neck because he spun around so quickly to keep his eyes on this red bearded, tattooed, white skinned man! You buy your cell phone minutes at the grocery store or almost any store; just NOT at the phone store. Lanes on the highway are suggestions. We spend a lot of time in taxis and it is an adventure. If there is any bit of space at all the driver will get into it. Who cares about lanes?! Cuantos Cuotas = How many payments? : If you use your debit/credit card at any location you will be asked this question. Whether you are buying a burger from McDonald’s, a basket of groceries, or a refrigerator, you will need to have an answer. Uno (1) is always preferable! We have learned so much since we have arrived and know that there is so much more to learn and experience. Feel free to message us with the questions you have about our new life here in Bogotá. We would love to answer them or include them in future blog posts.